As much as we don't like to think about it our bodies host a variety of microorganisms, including fungi. Some of these are useful to the body, some produce no harm or benefit, and some can cause harmful infections in the skin, nails, beard and scalp. They include mold-like fungi called dermatophytes (Greek for body plants) and yeast-like fungi (such as candida). Ringworm - ring-shaped, slightly itchy, red or pink raised patches with a clear center. Jock itch - a ring-like red rash around the groin area sometimes in the form of small, painful, extremely itchy blisters. Athlete's foot- itchy, scaly rash between the toes. There may be mild irritation or cracking and peeling of the skin. The skin becomes sore and susceptible to bacterial infection. Scalp and beard ringworm -scaly, itchy patches and loss of hair in small circular patches. Nail fungus - makes the nails appear dull, thickened, brittle or distorted. 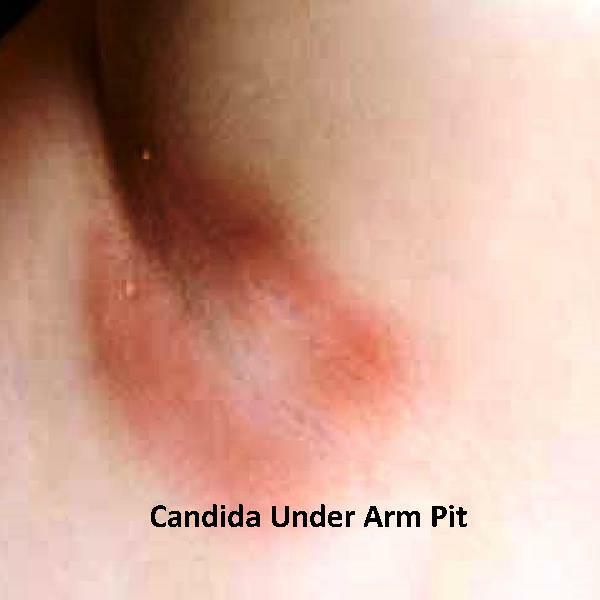 Candida - typically occurs in moist, warm areas of the body such as skin folds (under breasts) and diaper areas. Superficial candida skin infection appears as a red, flat rash with scalloped, sharp edges. Fungal infections of the skin respond quickly to topical treatments. Mild nail infections and those caught early do respond to topical treatments, however you must be consistent in application and patient. Treatment will not reverse the condition of the current nail but will allow new healthy nail growth. Nail tissue grows very slowly taking a year or more for total replacement. Beware oral anti-fungal prescription medications such as Lamisil and Sporanox which have been associated with heart and liver damage. A prescription anti-fungal nail lacquer marketed under the name Penlac may be a better choice with less severe side effects - but reviews on effectiveness were lukewarm. Pure Emu Oil will not kill fungus, neither will it allow fungus to grow - it is considered a bio-static, meaning it inhibits the growth of microorganisms such as virus, bacteria and fungus. It's best use is as a trans-dermal carrier of anti-fungal ingredients allowing them to penetrate deep into infected tissue or through the nail. Most fungal infections can be successfully treated with our All Natural Anti-fungal Cream. Additionally it relieves the itch associated with fungal infections and speeds the healing of normal skin tissue. Those with chronic fungal problems should do research on Candida overgrowth a condition of excessive colonization in the intestinal track by the Candida Albicans fungi. This condition can severely undermine your body's immune system opening the way for other fungal infections and a whole range of problems. You must remember that trying to control the symptoms of a condition without understanding or addressing the factors that brought it on is always going to be an uphill battle. There is a lot of information online about Candida - most address recovery through herbal cleanses and dietary changes. My go-to company for information and products for Candida is Body Ecology.